Do Not Fear An Ingrown Toenail...Treat It! 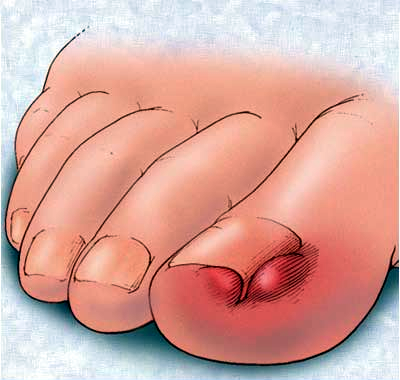 When a toenail is ingrown, the nail is curved downward and grows into the skin, usually at the nail borders. This “digging in” of the nail irritates the skin, often creating pain, redness, swelling, and warmth in the toe. The most common cause of ingrown toenails is improper trimming. Cutting your nails too short encourages the skin next to the nail to fold over the nail. Another cause of ingrown toenails is wearing shoes that are tight or short. Ingrown toenails can also occur as a result of trauma, such as stubbing your toe, dropping an object on the toe, or from sports that involve pressure on the toe, such as kicking or running. Treatment for an ingrown toenail varies depending on the severity of the condition. Surgery to correct an ingrown toenail is a simple, in-office, procedure to remove the offending border of the toenail. It generally involves numbing the toe and removing a small border of nail. In some situations, removal of the entire nail may be necessary. If the ingrown toenail is found to be recurrent, permanent removal of the offending nail border may be recommended. This involves a technique to destroy the nail root to prevent further growth of the portion of toenail. Prevention of ingrown toenails is the best treatment of all. Proper trimming of the nails help to prevent ingrown toenails. Toenails should generally be cut straight across and not too short. Also, avoid poorly fitting shoes, especially ones that are tight in the toebox. If you notice the start of an ingrown toenail, avoid “bathroom surgery” and contact our office for a quick appointment.